British sports car maker Caterham has unveiled its first collection of motorbikes. 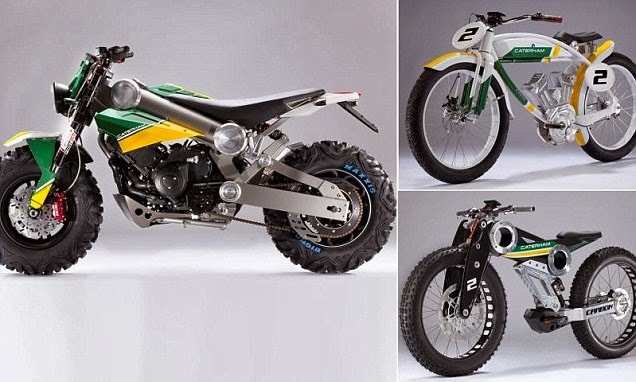 The iconic firm, which is a favourite of Simon Cowell, launched a rugged motorbike it is calling an SUV on two wheels, alongside a pair of electric bicycles. The firm's aggressive-looking motorbike is named the Brutus 750, and will be going on sale early next year. The motorbike has chunky tyres and can be operated as a street bike, off-roader and even a snowmobile with slight modification. It claims to be the first motorbike with automatic transmissions as well as the 'first ever two-wheel SUV'. Caterham also unveiled two electric bicycles, which can be ridden on the road without a driving license, but so far there is no news about how fast each of the models might be able to go. The Classic E-Bike has a retro look and a range of up to 45 miles, while the Carbon E-Bike is inspired by Caterham’s F1 technology.